This instruction is being given to Moshe, to bring together - the whole assembly of the Children of Israel - and to give them this command: "You shall be holy". Why should it appear here, in the middle of the book of Vayikra, the instructions for the priests and for the rituals of worship? The rabbis record a number of opinions in Midrash Rabbah. In one of these, "Rabbi Hiyya taught: This section was spoken in the presence of a gathering of the whole assembly, because most of the essential principles of the Torah are attached to it" (Vayikra Rabbah 24:5). According to Rabbi Hiyya, this command is followed by the most important premises of the Torah. 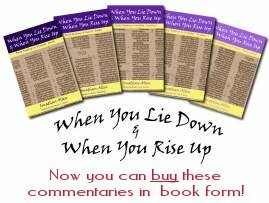 Rabbi Levi then explains, "Because the Ten Commandments are included in it. Thus: (1) 'I am the Lord your God' (v. 3); (2) 'Nor make to yourselves molten gods' (v. 4); (3) 'And you shall not swear by My name falsely' (v. 12); (4) 'And you shall keep My sabbaths' (v. 3); (5) 'You shall fear every man his mother, and his father' (v. 3); (6) 'Neither shalt you stand idly by the blood of your neighbour' (v. 16); (7) 'Both the adulterer and the adulteress shall surely be put to death' (v. 10); (8) 'You shall not steal' (v. 11); (9) 'You shalt not go up and down as a talebearer' (v. 16); (10) 'You shall love your neighbour as yourself' (v. 18)" (ibid.). Baal HaTurim adds that "for the recitation of a sacred matter, a minyan. This is defined in the Talmud: "every act of sanctification requires not less than ten. How does the verse denote this? As Rabbi Hiyya taught: We explain the word 'among' here by reference to its use in another place. It is written here, 'But I will be hallowed among the children of Israel' (Vayikra 22:32), and it is written elsewhere, 'Separate yourselves from among this congregation' (B'Midbar 16:21); and we further explain the word 'congregation' here by reference to what is written in another place, 'How long shall I bear with this evil congregation' (B'Midbar 14:27)" (b. Megilah 23b). Because the ten spies who brought back a bad report were described as a 'congregation', the Sages determined that the smallest number that could be described as representative of the people of Israel was ten. The Tur goes on to point out that the phrase "I am the L-rd your God" then appears ten times in this parasha. Nechama Leibowitz also confirms Levine's diagnosis: "The present chapter was therefore given in full assembly to ensure that all heard Moshe simultaneously, and to avoid a situation wherein different groups might claim to have variant messages". Just as Yeshua was later to say, "Any kingdom divided against itself is laid waste; and a house divided against itself falls" (Luke 11:17, NASB), it was vital that the people should be united and working from the same sheet of paper, the same blue-print, towards the same goals and objectives; otherwise chaos would ensue. Sforno wants to know why G-d told them to be holy. He replies, "this is in order that they imitate their Creator as much as possible, as was the original intent when man was created, as it says, 'Let Us make man in Our image, after Our likeness' (B'resheet 1:26). The Sforno sees mankind as having been created in the image of G-d and - originally - holy. At that time, sin had not entered the world, so the first man and woman were sinless, just like their Creator. Only later, after the Fall, when they had disobeyed G-d, could Adam and Havah no longer be described as sinless or holy. For this reason, the Sforno suggests, G-d is urging the Jewish people to be holy, to obey His commandments, so that they - as His chosen people, set apart from the other nations of the world - should be a witness to the world of G-d's original design was supposed to look like. There are many examples, both today and throughout history, of groups who have a legitimate grievance or cause about which they campaign or protest. In the vast majority of cases, their meetings, marches or other legal activities are abused or infiltrated by others whose sole agenda is to cause trouble and act in a violent or illegal way, under cover of the main group. In this way, many good and worthwhile initiatives are given a bad name by those who - often deliberately - behave badly and bring disrepute upon the whole. Jewish people today get bad press and accusations of inconsistency because although there are many Jews who work hard at keeping the commandments and living thoughtful and intentional lives to be a witness to G-d and His holiness in the world, there are Jews on both ends of the spectrum who let the side down and give the rest of us a bad name. On the right-wing of the scale, ultra-orthodox Jews in Israel, dressed in their characteristic black and white garb, attack policemen and throw stones and bottles in order to "protect the sanctity of Shabbat" or spit and shout obscenities at women they consider improperly dressed. On the left-wing, Jews who don't even believe in G-d work on Shabbat, eat pork and other forbidden foods, and engage in or profit from immorality while, in the same breath, proclaiming that they are proud Jews and children or grand-children of Holocaust survivors. The Christian world is not exempt from this inconsistency either. Closed Brethren groups exclude those who do not dress and behave in the same way as they do, even though those they criticise hold perfectly mainstream beliefs and practice; charismatic groups can exclude and brand as second-class or 'incomplete' Christians those who do not manifest the gifts of the Spirit in the same way as they do. Liberal Christians will embrace anyone who is not 'intolerant', while openly doubting the authorship and truth of all or most of the Bible. The label 'Christian' has become an almost meaningless affirmation of living in the Western world and being mostly law-of-the-land-abiding citizens within a loose Judeo-Christian culture. Even many of those currently being compulsorily provided with free board and lodging at Her Majesty's pleasure would describe themselves as Christian simply because they were born in this country and have never (or only occasionally) beaten their wives. All these distinctions miss the point that the whole people are told to be holy, not just the priests or some other group. The holiness of the whole people depends on and is affected by each individual. One rotten apple can spoil the whole barrel. This applies to all the members of the body of Messiah, whether they call themselves Christians, Jews or Messianic Jews. Peter echoes this text in his first letter, while Rav Sha'ul makes sure that his disciples and churches understand: "For G-d did not call us to live an unclean life but a holy one" (1 Thessalonians 4:7, CJB). Don't misunderstand this as a call for ecumenism or unity in the body of Messiah based upon the minimum common values and beliefs. G-d is not interested in us watering down His principles to the lowest common denominator, in order to accommodate those who believe the least. Neither is He interested in His people trying to out-do each other in "holier-than-thou" attitudes and behaviour. We are to be holy, think holy, live holy - eat, sleep and drink holy - in all of our lives and everything that we say or do. And holiness, as the list of commands following this initial verse shows, includes loving our neighbour as ourselves. Recognizing that neighbors (read: fellow believers, church members, shul companions) do sin, do not keep all the commandments (that apply to them), don't even know all the commandments (that apply to them), we are to encourage rather then rebuke, we are to help rather than criticise, we are to bless rather than scorn or deride, we are to draw alongside rather than separate. This is that the whole body may be raised up to a greater level of holiness and relationship with G-d, that "we all arrive at the unity implied by trusting and knowing the Son of G-d, at full manhood, at the standard of maturity set by the Messiah's perfection" (Ephesians 4:13, CJB). Application: Is there something that you can do to be more holy, more consistent in your walk with G-d? If so, why not find someone else who you think might have the same problem and ask them to pray with you about it or to hold you accountable for getting it right as a way of encouraging them too.